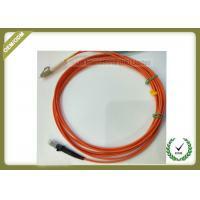 Optical fiber jumper / pigtail is the largest and most basic component in optical fiber communication system. There are many kinds of hopping wires composed of different connector types and different types of optical cables. They are widely used in optical communication networks such as FTTx, MAN, WAN, CATV network, and active equipment debugging and testing. H-LIN has set up a jumper processing base since 2005. In addition to providing various types of connectors and corresponding adapters, it can also process different types of optical cables into jumpers, single-core, double-core, multi-core, bundle or strip, with strict curing time and temperature control and strict testing standards. On the basis of accurate and rigorous quality inspection methods, nearly 12 years of professional experience, more than 300 enterprises at home and abroad to provide high-quality and low-cost jumper products, products meet Telcordia-GR-326, IEC standards and RoHS requirements. Transfer jumper can be FC-LC, FC-SC, FC-ST, FC-MU, FC-DIN, single-core jumper or double-core jumper, single-mode jumper or multi-mode jumper, etc., at the customer's option. There are many kinds of jumpers for choice. Wiring in communication base, wiring in distribution box. Optical fiber communication system, cable television network, telecommunication network. 1: All our patchcord use Sanhuan ceramic ferrule,with brand new Changfei or Corning fiber as customer requested. 2: The connector of patchcord can be with different color boot. 3: Jacket of cable can be marking description as requested. 5: The label of patchcord also can be made as customer's requirement.